New Orleans Musician's Relief Fund - a grass roots certified 501(c)(3) not for profit organization dedicated to aiding New Orleans musicians affected by Hurricane Katrina. 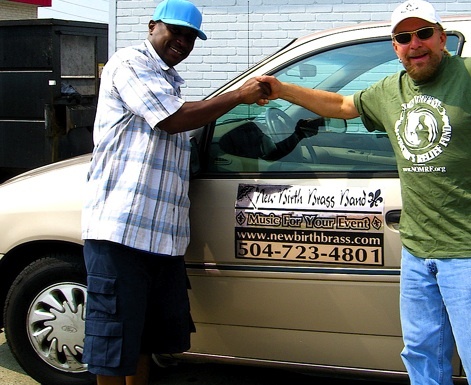 The New Orleans Musicians Relief, a grass roots charity founded by displaced New Orleans musicians after Katrina provided grants, instruments and gigs for New Orleans musicians. Our nonprofit is grateful to those who have contributed instruments to musicians, professional and beginners, including trumpets (at left), violins, electric guitars, antique upright bass, grand pianos, housing, cars and guitars. It's been years of blessings. nomRf was able to present a 100 year old Czech bass to a student at NOCCA Thelonious Monk Institute Jazz program. In one of our charity's most poignant memories since kicking the whole thing off in 2005, nomRf brought the Great Southwest Holiday Toy Sleigh Ride to musicians’ children. The airline gave the New Orleans Musicians RELIEF Fund space to bring 200 pounds of toys from Chicago to New Orleans post-Katrina, and we also mailed toys to displaced musicians’ children. So many toys came in, former WWOZ DJ and New Orleans music legend the late, great New Orleans musician Bob French announced that families could pull up out front of the studio while we distributed everything from skateboards to drum kits. 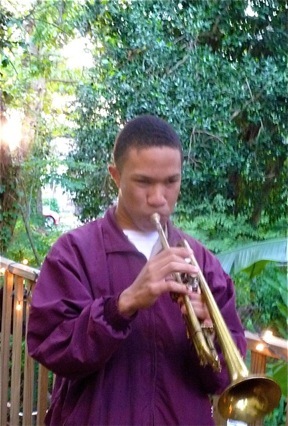 Thank you for keeping New Orleans music in your heart, and for all the instruments that came in for over a decade. Our founder is now retired and working on his health, but we encourage donations to local charity Roots of Music to keep the music and culture of New Orleans alive. 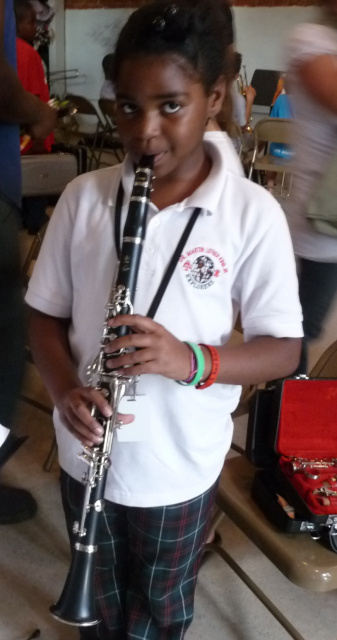 Instruments can also be donated to the Habitat For Humanity Musician's Village. The New Orleans Musicians Relief Fund has given out Rock n Roll Fantasy Camp scholarships and, thanks to Chicago teenager Mel who donated her Bat Mitzvah funds, guitars for 14 young New Orleans musicians including Jazz (at right). 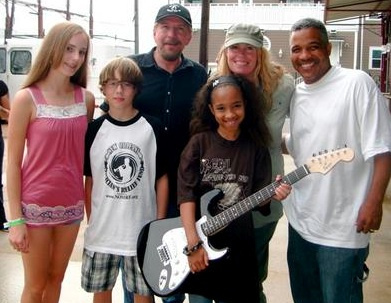 One of the young rockers was able to play his new guitar at Rock Camp along with New Orleans musician Shamarr Allen. The rock counselors spent time with the legendary Smokey Johnson and Cosimo Matassa and named their group the Cosimo's Kids, winning Best Set of the Tour. Shamarr ran the nonprofit Silence is Violence to give back to the community, and has a hit with "Hit da Sean Peyton"
In the first few years after the federal flood, the New Orleans Musicians Relief Fund, Inc. was able to mail hundreds of direct emergency grants to musicians across the country to help them return. One example is Tanio Hingle of New Birth Brass Band, here with NOMRF's co-founder Jeff Beninato. When his nomRf-donated van was unfortunately stolen, the lawyer who processed the donation paperwork was moved to donate her husband's car just in time for his family's evacuation.